When words come out of the heart, they enter the heart. Welcome to 2nd Edition of Online Sufi Poetry Carnival jointly hosted by Court of Lions, Abdur Rahman's Corner and Inspirations and Creative Thoughts sites. The Way of the Sufis, the mystics from the dimension of Loving Universal Submission to Divine or Islam, is like a holy well of sacred experience and has inspired some of the finest mystical poetry given to the world. The appeal of Sufi poetry is universal. Great Sufi poets such as Rumi, Hafiz, Yunus Emre, Kabir and Omar Khayyam are appreciated across the world transcending the boundaries of culture, faith or nationality. This is because their poetry expresses the universal aspirations of spiritual seekers. Sufi's are lovers of the Truth who knows God as Al-Haqq or 'The Highest Truth' and who sees the Face of Beloved 'wheresoever they turn'. Sufis are sometimes called the Masters of Love because the Sufi path strives for ecstatic ego annihilation in the fires of Divine Love. Through love and devotion they seek to become 'one' with their Beloved. Traditionally it is through poetry that sufi mystics encapsulate and share their spiritual experiences. The theme of Sufi Poetry Carnival, 2nd Edition is 'Knocking From Inside' which was an open invitation to express the pristine state of 'bewilderment', often experienced and expressed in sufi path and through their literature, including fine art of poetry. The 2nd Edition of Online Sufi Poetry Carnival is also proud to feature Tiel Aisha Ansari's newly published beautiful book of Sufi Poetry: Knocking from Inside. + Here is a review and glimpse of the book. 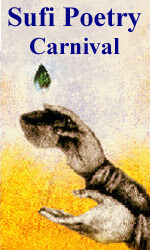 Finally, following is the assembly of poems submitted and selected for the carnival. Our deep appreciation to all who participated in the carnival. Please click on each title to read the poem in full. Bismi'Llah.
.: Gridlock | Barbara L.